At seven minutes past midnight, thirteen-year-old Conor wakes to find a monster outside his bedroom window. 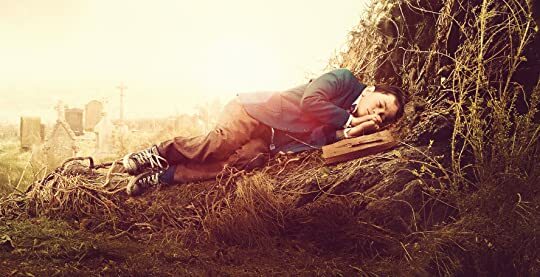 But it isn't the monster Conor's been expecting - he's been expecting the one from his nightmare, the nightmare he's had nearly every night An unflinching, darkly funny, and deeply moving story of a boy, his seriously ill mother, and an unexpected monstrous visitor. At seven minutes past midnight, thirteen-year-old Conor wakes to find a monster outside his bedroom window. But it isn't the monster Conor's been expecting - he's been expecting the one from his nightmare, the nightmare he's had nearly every night since his mother started her treatments. The monster in his backyard is different. It's ancient. And wild. And it wants something from Conor. Something terrible and dangerous. It wants the truth. 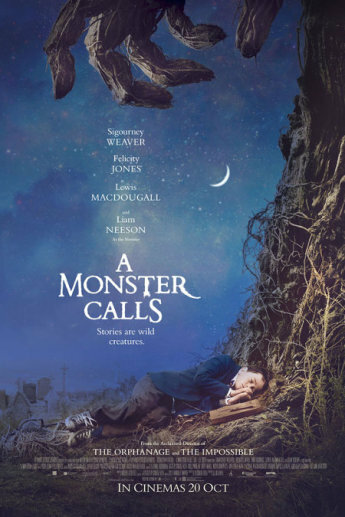 To ask other readers questions about A Monster Calls, please sign up. Neil I'm 40, have just read it and it destroyed me. No age limits on something this perfect. Tami The Candlewick Press edition that I own does not have any illustrations. However, I didn't cry because of what the book in general, necessarily, but because of what it did to me. It drags out your saddest memories and pains, kicking and screaming, makes you look them right in the face and watch them all happen all over again, no matter how much you don't want You can also find this review on my blog, Cait's Corner! Please excuse my ramblings, I read A Monster Calls in three hours and I am still extremely emotional. I should not have been given access to a computer after such a powerful book. As I am writing this, there are still tears coursing down my face--black from my mascara. I may look like something straight out of a horror movie, but my soul feels lighter somehow. I was fooled into thinking this would be a simple story as it is only 200 pages, but it is not. It is so not. This book is raw and emotion Please excuse my ramblings, I read A Monster Calls in three hours and I am still extremely emotional. I should not have been given access to a computer after such a powerful book. I got back to my apartment in Bulgaria and thought I'd read a little bit of this novel before I went to bed. 2 hours later I was still sat in my original position but by this time I was sobbing my heart out. Literally sat there crying like a baby to myself. I doubt this book will be everyone's cup of tea but, whatever it has, it really worked it's magic on me. 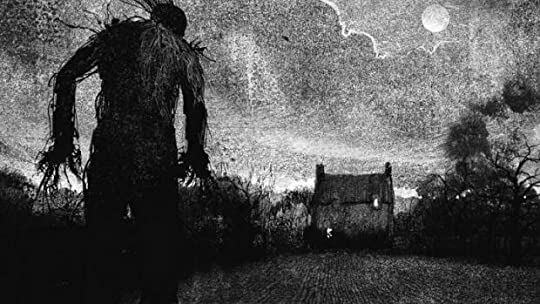 I thought A Monster Calls was pretty much amazing in every way; from it's darkly beautiful illustrations (worth buying a paper copy for) to the great big touching metaphor that is the backbone of the story. Didn't like The Knife of Never Letting Go? Not a problem. Forget it's by the same author whether you liked his previous books or not. 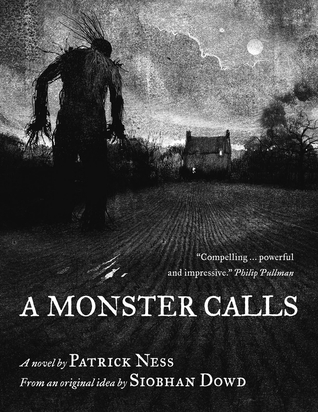 Pretend you've never heard of Patrick Ness before because this is nothing like anything he has ever written. It's nothing like anything I've ever read. Where the Chaos Walking trilogy was a fast-paced adventure story, this is a very moving, well-written tale of a boy who's mum has cancer. It's about loss, and that doesn't necessarily mean death, and it's also about learning to let go and forgive yourself and others around you. Think you've got it? Think you've worked out that the 'monster' is going to be cancer itself? Think again. Like I said, this is a very different sort of idea (credit to the late Siobhan Dowd) and not the kind of book where you can guess where it's going. It's odd and unpredictable and very sad. Conor is one of those tragic but believable characters that you feel for all the way through. He faces constant battles in every aspect of his life. There's the obvious problem of his mother's illness, but also the fact that his dad has moved to America to start a new life with his new wife and baby. School offers no escape from Conor's miserable reality either as he finds himself between bullies who pick on him because they can and teachers who make their pity obvious every time they talk to him. Then one night a monster visits Conor. A dream? An ancient creature that appears to those in need? Anything is possible, none of which is important. This monster is here for one purpose... to tell Conor three stories in exchange for the truth. Conor begins to learn that things aren't always as they seem and right and wrong are not so easily defined. I loved it. It was nothing that I expected but I hope Siobhan Dowd's idea will inspire Patrick Ness to write more like this. I just read this book from cover to cover. I have no idea how to rate it. It is the worst book I've read. It's ripped my heart in two. It'll make you think of losing the one person who means the most to you. Or it'll make you think of those you've already lost. It's not a happy book, but it's an important one. 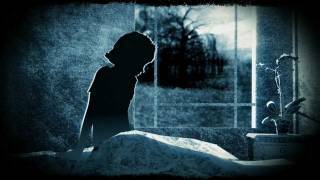 Conor's nightmares begin shortly after his mother starts her treatments for In the dark of night, when the house is still, what fears creep into your heart? For Conor O'Malley, his nightmares take the shape of a very old and very dangerous monster who visits him every night at seven minutes past midnight. He's half-convinced that these must be dreams of his fevered mind. But how can they be, when the visits are so vivid and when he finds physical evidence of the monster's existence the next day? <--- This was me on Saturday. I can’t write a review about this book, I just can’t!!! 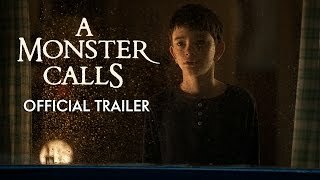 Heaven knows I’ve tried to, but whenever I think about “A Monster Calls” I’m tearing up again. Just to think about this book is already dangerous. it makes your throat go tight with sadness and pain. It forces you to think! I can’t even tell you what exactly causes me to cry. Maybe it’s the entire book, maybe it’s the monsters painful wisdom, maybe it’s just the bitter truth? All I know is that this story moved me. It moved me on a level books rarely do and it’s one of those books you wish you never read, but at the same time you’re so glad that you actually did. No matter how old and wrinkled I’ll become, I’ll always remember this story and it will always have a place in my heart. A.L.W.A.Y.S.! So I guess what it comes down to, is that I won’t talk about this book. I won’t talk about a boy who was forced to grow up way too fast. I won’t talk about his anger and despair, about his hope and fears. I won’t talk about his crushing loneliness or his endless pain. I won’t talk about a mother who tried to do what’s best for her son. I won’t talk about her frustration and helplessness, about her worries and concerns. I won’t talk about her unconditional love for her boy nor will I talk about her courage and strength. I won’t talk about a grandmother that didn’t know how to deal with the situation. I won’t talk about her mental overload or that she was so very anxious and afraid. I won’t talk about her display cabinet or her inability to find the right words. I won’t judge her because Conor’s mother is her daughter too…. I won’t talk about real friends and bullies. I won’t speak about teachers that did the wrong thing for the right reasons. because I won’t talk about the freaking TRUTH!!! Because I’m crying once again and I can’t type anymore. Because as the mother of a child to read this book was so very painful. Because the truth hurts and it’s easier to close your eyes. He couldn’t look at her. He just couldn’t. ”Conor held tightly onto his mother. Such a beautiful and gripping story. I feel like this is one of those books that will stay with you long after you've read it. A Monster Calls by Patrick Ness is a book like no other and one that I'll never forget. My first rating in January on this book was 4 stars. I couldn't figure out why, I just didn't love the story. I re-read it this past weekend and I've revised my review. I was very angry, then sad, then had mixed emotions in between. My main issue when I first read it was that I wanted more of an ending, or perhaps more before the ending. Maybe I wanted a different outcome because I was so hopeful for Conor. I don't know, but after reading it again, without a doubt, I know I just can't handle the truth. As a mom, my worst nightmare. With that said, I've pondered over it and feel this book deserves 5 stars. It's a book I'd still recommend to anyone and I'm very much looking forward to seeing the movie. The illustrations by Jim Kay make the book feel so real. This is a book I want to keep forever. 5**** to one powerful story. Whyin the world did I re/read this right now! Conor's mom is dying, he won't believe it. He says she's just having her treatments and she will get better like last time. I'm not really sure if the yew tree monster is in his mind to help him or if it's real. I like to think it is a little of both. It is there coming to Conor's window trying to get him to come out and talk to it. I really liked the graphics in this book, they are not not oh and ah, they are just Whyin the world did I re/read this right now! I really liked the graphics in this book, they are not not oh and ah, they are just graphics that tell a tale! Conor gets bullied at school, but this doesn't really seem to bother him. Maybe it dulls the pain of what's going on with his mom. Conor's dad comes back from the states to visit with him a little bit before..... Conor is living with his grandmother, whom he doesn't seem to like very well at first. Conor was hoping the yew tree monster would visit him at her house and he finally did... this caused a lot of destruction. "I've been thinking it for the longest time," Connor said slowly, painfully, struggling to get the words out. "I've known forever she wasn't going to make it, almost from the beginning. She said she was getting better because that's what I wanted to hear. And I believed her. Except I didn't." Connor swallowed, still struggling. "And I started to think how much I wanted it to be over. How much I wanted just to stop having to think about it. How I couldn't stand the waiting anymore. I couldn't stand how alone it made me feel." He really began to cry now, more than he thought he'd ever done, more even than when he found out his mum was ill. 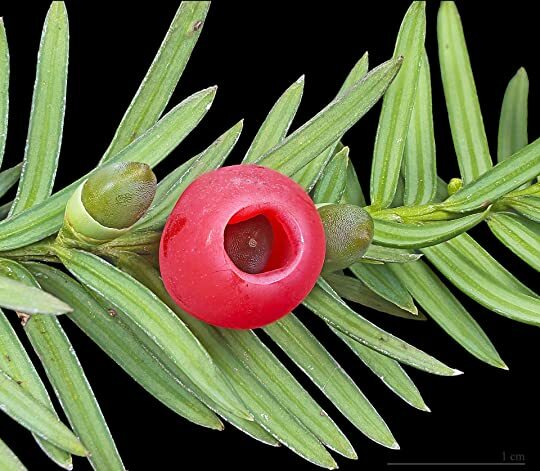 The yew monster tells stories to Conor, trying to teach him something until he gets to the last story and has to leave. I can't say any more, I don't want to give out any more major spoilers. I just know this book is so very good and it will break your little heart. this book is a perfect modern fairy tale. not a nice disney one with singing birds where everyone gets to go home with their prince and all of their limbs, but the older, darker kind involving foot-choppery and decimation. lemme step back a bit. i added this book to my to-read shelf the moment i saw its cover here on goodreads.com. i knew nothing about it except that something in me bellowed "WANT!" i did not win it in the firstreads giveaway (naturally) and as more and more people began writing r this book is a perfect modern fairy tale. lemme step back a bit. i added this book to my to-read shelf the moment i saw its cover here on goodreads.com. i knew nothing about it except that something in me bellowed "WANT!" i did not win it in the firstreads giveaway (naturally) and as more and more people began writing reviews for it, i discovered that it was not at all the kind of book i had thought (spooky horror), and was in fact something far more insidious and lasting. 1) this is how all my reviews are. welcome. 2) i am afraid of reviewing this book. it is tricky business, isn't it, sometimes? on the one hand, if i had not read other reviews on here, i would have gone into it thinking it was going to be a typical horror story. and who knows how i would have responded when i found out the actual tone of the book? but by not saying anything, who knows if this book will reach the correct audience? i will say this: it is a beautiful book. and i mean that both in the book-as-object sense and in its contents. don't ever read this book on a device - you are missing half its power - a unicorn without its horn is just a horse, after all. this is a nearly-perfect book that every human should read. its treatment of the subject is incredibly sensitive, and conor is someone it is impossible not to feel for. although some of the specifics are limited to experiences in childhood, the majority of it has universal kick-in-the-heartedness. (i could not find an appropriate "real" word. that is all i have)it depicts helplessness and bravery and loss so very well. and it never feels manipulative, which is so rare in books like these. it only missed out on that fifth star because i was sure, after hearing other people's commentary, that is would make me cry. why do i have to be such a damn robot? but other than that, i cannot recommend this book highly enough. read it, write a better review than i have, and then gather your loved ones to you. OMG, I’m a 40-plus-year-old DUDE and I almost lost it a couple of times. There is not always a happy ending. I know this, we all know this, in life as in fiction. Hell, I even welcome it sometimes and give a “meh” to too cheesy a Hollywood ending or even a thumbs down to a deus ex machina. As any reader of Cormac McCarthy knows, sometimes the best ending is not the one that leaves us all warm and fuzzy. Patrick Ness’s 2011 short novel was based on a concept from TEAR JERKER ALERT! Patrick Ness’s 2011 short novel was based on a concept from Siobhan Dowd, who died of cancer in 2007 at the age of 47, way way too soon. In this young adult novel (but also for the rest of us) young Conor O’Malley is dealing with the terminal illness of his single mother. As if that is not bad enough, he’s getting picked on at school. Then a monster “comes walking” and things get interesting. Ness keeps the syrup on the table but tells this somber fantasy straight and it works. The characterization is real and the dialogue is what you expect in real life. 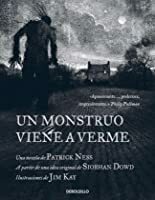 The drawing of the monster was also excellent, casting from ancient myth, legend and from psychological elements to create a fantastic but believable relationship between Conor and the monster who always shows up at the same time. Highly recommended but keep the tissue paper in reach. Still incredible. Of course. I actually listened to the audiobook this time around (while flipping through the book to experience the gorgeous illustrations again) and it was FANTASTIC. Jason Isaacs read the book, and of course it was a pleasure to have him tell this story. I recommend this to every single person ever. 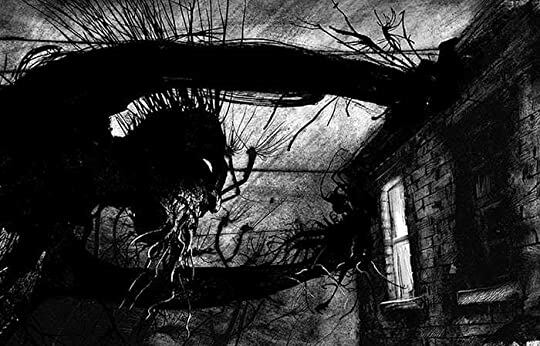 A Monster Calls has to be the most inventive book I've read this year. And I find myself struggling to put in words how much this book has touched me. But it did. If you haven't read A Monster Calls, I suggest you immediately purchase it. Don't read the e-book because you would miss out on the amazing artwork. This book is stunning. Masterfully written and beautifully drawn. I remember the first time a book made me cry like this. I was in eighth grade in my English class, sitting under my desk in the back of the room reading A Walk to Remember. If you've read that book you will probably understand why I cried. I'm naturally an emotional person, you see. I cry easily if I see another's suffering. At the time I was fortunate enough to not have yet experience the feeling of losing someone close to you. 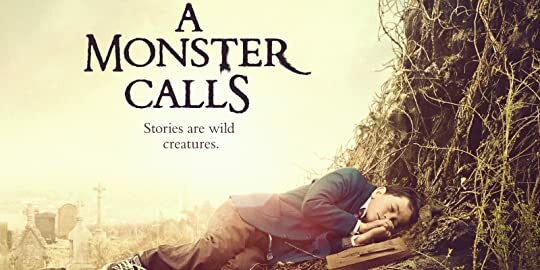 Unfortunately, I know that feeling all too well now and that is the reason I was initially afraid to read A Monster Calls. I saw my GoodReads friends reading and reviewing the book, but I couldn't bring myself to add it to my shelf. I had an idea of where it could take me emotionally, and it's not a place I choose to visit. I keep those memories locked up and tucked away. But this book made me remember. It made me remember the phone call. It made me remember the shock, the pain, the regret, the denial, the limo ride, the funeral, the casket, the anger, the depression, the trials. It made me remember my brother, who on some days I choose to forget because it's easier that way. Maybe that sounds horrible, but it's true. It's an awful truth. Someone please send some chocolate, a hug, and possibly some Irish scotch my way. If I'm not dead already, that is. I feel nothing but numbness right now, though, so it could easily be both. It touched me in some very sensitive spots, rubbed its salty and bookish Someone please send some chocolate, a hug, and possibly some Irish scotch my way. It touched me in some very sensitive spots, rubbed its salty and bookish paws against wounds that are still too fresh for it to not hurt like hell. I hate it with the burning passion of someone who's lived through something similar and felt the same kind of pain deep within their bones. I hate it because it did nothing but remind me of how necessary it is, sometimes, to deal with the monsters we carry around in order to feel better with ourselves and the world that surrounds us. I've never read anything nearly as awfully beautiful as this story is. The way it's written, the timing, the darkness behind the words. Everything is so perfect and it hurts so bad it's almost good. A devastating masterpiece. A glorious goodbye letter filled with tears and courage. A sharp and bleeding piece of heart disguised as a 200-something-page novel. I wish I'd read it sooner, I wish I never did. I hate it, hate it, hate it and, at the same time, love every bit of it. Every line and every page, from my first breath to the last. And if no one sees you, are you really there at all? I don’t think I can write a review for this book. 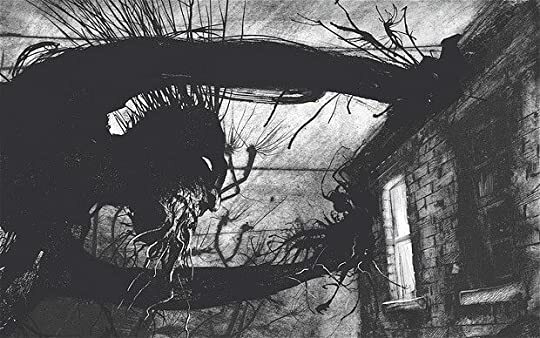 I feel neither equipped, nor inclined, to make an evaluation of A Monster Calls based strictly on its literary style and merits. (Therefore, if you’re looking for an analysis of the plot, characters etc – you will be better served with another review). So I’m writing a response instead. Or, I will attempt to. I have a difficult relationship with books that deal with the subject of death and grief. Occasionally, I find a book that is moving and re I don’t think I can write a review for this book. 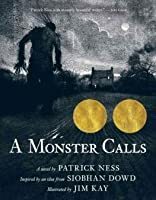 I feel neither equipped, nor inclined, to make an evaluation of A Monster Calls based strictly on its literary style and merits. (Therefore, if you’re looking for an analysis of the plot, characters etc – you will be better served with another review). Occasionally, I find a book that is moving and resonant - and I will both love it and feel jealous of it, for being able to articulate things I never could. Books that somehow translate raw emotion into words, that create a mirror out of ink and paper, reflecting back things I know to be deeply true and real (to me, at least). Then there are the books that make me feel like my emotions are being traded on, manipulated, cheapened. Reducing it to fuel for an angsty teen plot line. Presuming my tears can be bought for the cost of a $19.95 paperback. I can distinctly recall watching a film recently and walking out completely dry-eyed and practically spitting with rage at the distinct feeling that grief was being commercialised on. That such an incredibly personal experience and the accompanying emotions could be held to ransom by an overwrought, histrionic movie. Yes, I took it personally. Because it was personal. A couple of months before I turned fifteen, my father died. It was sudden, an accident. We’d had dinner as usual. He was working nights and left soon after. I hadn’t said goodbye to him because I was annoyed about something. Less than two hours later, he was dead. I could tell you exactly what clothes I put on after my brother told me I had to get out of the shower and get in the car. I could tell you exactly which Renoir print hung in the white, soulless room we were herded into at the hospital. I could tell you, word for word, the first thing my Mother said after we were given the news. What I can’t tell you is what happened after that. Well, after a time, things came back into focus. But there is a great chasm in my mind that covers the rest of that night and the following days and weeks, as if my brain realised I couldn’t bear it and filled that space in with darkness so I wouldn’t see any of it. Now, it feels almost like a presence, something that has grown with me in a strange, symbiotic way over the years. Mostly, these days, it’s a shadow, lying quiet and dormant, but making itself known by shading my memories, colouring the way I speak and act all this time later. At other times, it is a thick, solid wave, filling up my body so that I’m afraid to speak, terrified that I might unleash a torrent I can’t stop. That I might be overwhelmed, suffocated, drowned in sadness. I strongly believe that grief and death are deeply personal things that no one experiences in exactly the same manner. And I suppose that this is why some book and film interpretations make me so upset, that they somehow think they can package up the experience and present it to you, neat and orderly. ”Here is the sadness you ordered! Here are the steps you will pass through! You should cry.. wait for it…now!” The reality, I believe, is so much more complex than that. So, when people tried to reach out to me, touch me, say “I know how you feel,” – I wanted to lash out at them. To scream that they had no idea what I was feeling. All I wanted was silence. Someone close by, not to interpret my pain, but to bear witness to it along with me. 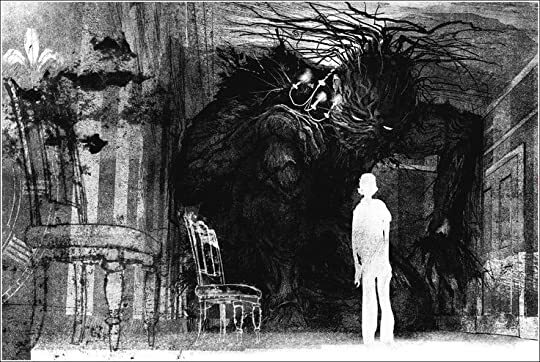 A Monster Calls is many things - beautifully written and stunningly illustrated amongst others. But what struck me the most about this book is that it was so terribly honest. It bravely spoke of things that are often harboured in our deepest, darkest centres – far under the surface of our outward manifestations of pain. The things that are kept locked away by fear. Things that go unuttered because we worry that saying them aloud might make them real, and somehow define us in some horrible, irrevocable way. Although this book did make me cry at it’s conclusion, I think in this case it was partly out of relief. The ideas expressed in this book, and very words uttered by the monster, allowed a weight to come sliding off my shoulders. I felt as if a personal truth had just been recognised and validated, in a very tender, respectful manner. Permission to accept that the thoughts I had pushed down as shameful and selfish, were just that: thoughts. Just one or two thoughts out of the millions I have had, but ones that I chose to hold on to and punish myself with for years. I have not read another book that expressed so much understanding of what this is like. I have not read another book that felt this empathetic – it doesn’t just acknowledge your pain, it is a shared experience. 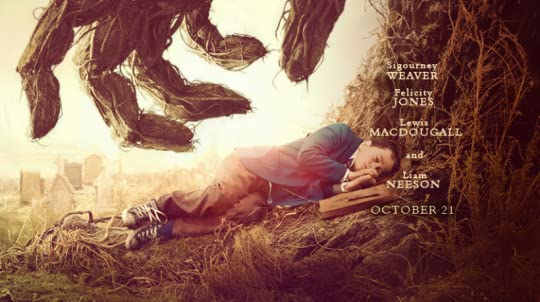 A Monster Calls is a special book, one to be absorbed, internalised and held very, very tightly. I hope that it others are able to connect and love this book, to feel it leave an indelible print on them once the covers are closed. 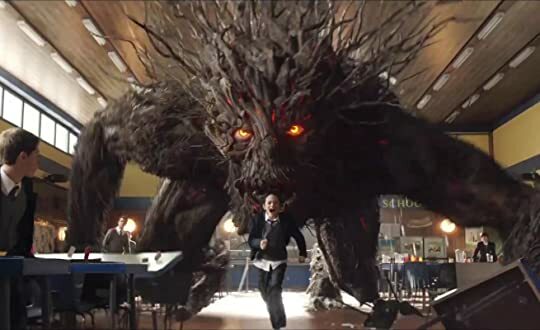 A Monster Calls did not constitute what I first visualized in term of story, plot and themes. Due to the spooky cover, mystifying title and evasive blurb, my mind pictured something closer to the fantasy world than our contemporary one. Yet, the author remarkably brought together the real and the unreal, inserted in the narration that which touches one, can tear another apart and is a component of what we call ‘‘life,’’ and skilfully unfolded what laid deep inside Conor hidden…in the fragile corn A Monster Calls did not constitute what I first visualized in term of story, plot and themes. Due to the spooky cover, mystifying title and evasive blurb, my mind pictured something closer to the fantasy world than our contemporary one. Yet, the author remarkably brought together the real and the unreal, inserted in the narration that which touches one, can tear another apart and is a component of what we call ‘‘life,’’ and skilfully unfolded what laid deep inside Conor hidden…in the fragile corners of his heart but that, at any moment, threatened to break free. I’m referring to emotions. Raw, vulnerable, intense and uncontrollable sentiments over which we, as human beings, scarcely hold control. Thirteen-year-old Conor tried to, though. He kept it all in: his indomitable worry for his mother’s health, his hatred for his grandmother whom wanted to take him away from his beloved parent, his sadness at growing without a father and the solitude that he felt at school while being surrounded by people who showed pity, avoided Conor or bullied him…every single day. But there was the monster too. Night after night, he visited Conor. He shared stories, thoughts and wiseness with this latter, in order to make him see things differently. But Conor was a stubborn! He heard, but he didn’t listen. He didn’t want to see the truth. He didn’t want to see, acknowledge or tell this truth. In order for Conor to breathe peacefully again, he might have to do just that. I’m being very brief and perhaps even confusing, unfortunately, but it’s only because telling you more risks giving away too much. I had a surprisingly beautiful time discovering everything by myself and seeing how wrongly I foresaw the content to be made of. It was more than I expected. It was more than I even hoped for. As the majority of noticeable books being found on this planet though, A Monster Calls carried a weakness, especially characterization-wise. I sadly merely perceived any background on the characters, primary or secondary ones. There were some I strongly sensed the need to learn more about, especially Harry and Conor’s grandmother…and even a little more detail would have satisfied my curiosity. Thank you Goodreads for graciously sending me a signed copy of A Monster Calls! I'm not crying because this book is sad. I'm crying because this book is my story. It's my family's story. It's my mom's story. A Monster Calls was a difficult book to read. I've seen many readers say they've cried because of the words written on these pages. But I've lived this book. My mother died of breast cancer two years ago at the age of 44. I lived the day when the doctors told my mom that she had breast cancer. I lived the day when I'd spend my 19th birthday visiting her on her hospital bed in the ICU while she was in a coma. I lived the day when I would see her take her last breath. I lived the day I let her go even if it was the hardest thing I ever had to do. Two years later, I wish I could tell you that it gets easier. I don't cry everyday anymore if that counts as getting easier. I'm not sure why I'm even saying all this, but I guess reading this book has made me feel a bit vulnerable at the moment. It's made me confront all kinds of emotions I've been trying to avoid since the day my mother passed. Although I was reading this book through Connor's eyes, it was like reliving the tough year my family had to endure together while my mom fought the battle of her life. I've felt every emotion that Connor experienced. I hated being pitied. I was angry. At myself. At the world. At God. And when his mother spoke, it was my mother speaking to me through her words. 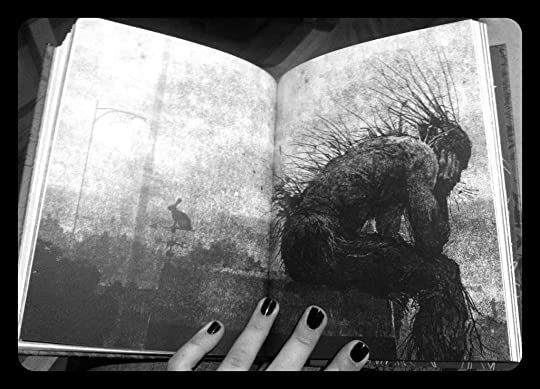 A Monster Calls was a painful book. There were times when I even had to put this book down to compose myself. But reading it felt a lot like... closure. It reminded me that it was okay to be angry. It was okay to hurt, to be scared. It was okay to let go. 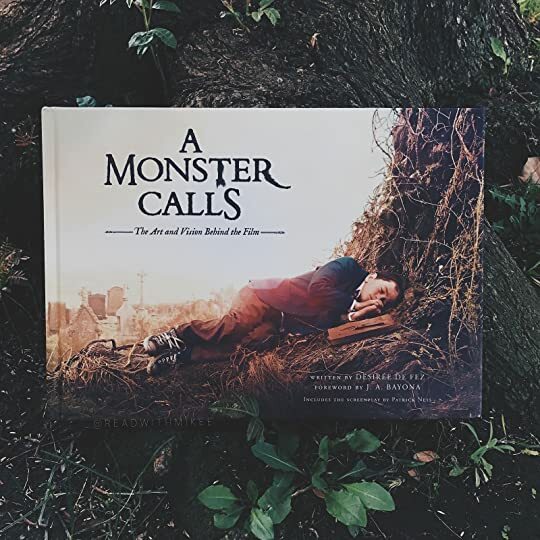 A Monster Calls wasn't a book that I would typically read, but I'm glad I did. I was putting it off for a while because I was trying to avoid the feelings that it would conjure up but it's a tale I know that many people would love. It was a tough ride down memory lane but my mom's battle with cancer was not always bad. Sure, there were bad days and even worse days. But it brought us together as a family. I was closer to my mom in the 11 months she battled cancer than I did those 19 years of my life. Reading this book brought back a lot of painful feelings but it gave me a chance to, somehow in some way, say goodbye to her once again. It's been 4 years since I read this and, ridiculous me, thought, "Yeah I was a bit emotional the first time, I wonder if I'll be the same this time..."
I'm still absolutely crushed and made whole by this book. It is a story that's so emotional and vivid in pain and suffering that my heart just broke a thousand times. And reading Ness' note at the end...he was just bringing this one thought to the table: having conflicting emotions. And he nailed it. It's something you don't even think about having, but it really is one of those things that say you're losing your innocence. When life becomes complicated enough to want and hate the same thing. But I swear I am fffsrshjs broken right now. My eyes were hot and damp (ok no tears fell but I'm not a physical crier) and right now I just want to curl up in a ball and (1) HURT and (2) hope that I can convey emotion so brilliantly in my own writing someday. Although ps I read it as a novel without the illustrations (blame the library tho, I tried to reserve the illustrated edition) and tbh why does it even exist without the pictures. What nonsense. Jim Kay's drawings are divine and truly add another element to it. I WANT TO SEE THE MOVIE NOW BUT ALSO...DO I????? I'm absolutely blown away at how much this book affected me. I nearly cried. (I never cry.) It was everything I wanted it to be + more. ALL THE LOVE. Okay, but reasons? Yup, hold your socks, I'll give you reasons . It's genuinely scary. It's middle-grade style scary, so not Unwind or anything. But it genuinely had me hooked in and wondering what the nightmare Connor wouldn't talk about was. The writing was simple and to-the-point, which made me shiver in the appropriate places. And the illustrations? Oh, be still my marvelling heart, the illustrations WERE THE BEST OF EVER. They made the book. I read a hardback and the illustrations wrapped around the text in places. OH. And the book makes use of formatting. I love books that think outside the box. I love the voice and style. And, wow, it sure had a message to say but it never preached. I hate preachy MG books. But this? Nope. Brilliant. I was SO into the story that by the end...crying buckets of tears bascially. It was magical but realistic. On one hand, Connor's mum is seriously sick and he goes to school and faces bullies. On the other hand, there's a yew tree monster that tells him stories and he gets trapped in nightmares. That combo is no end of awesome. This author is fast becoming one of my favourites. Very quick to read so if you are interested on it. You'll find out that you'd read it in no time. Also, it helps that it's a page turner, since the story has many elements to keep you hooked to it. I hate to classify books for some specific age, since I think that books shouldn't have any age or genre. Books should be read by men or women at any age and they should be as good as effective. However, one can't deny that the author made this story thinking i This is great book! However, one can't deny that the author made this story thinking in kids and/or early teenagers, but not matter that, I think that readers of any age can enjoy this story with the same impact and purpose. As C.S. Lewis said (and I am quoting not necessarily with the exact words) "that any children's story that it can't be enjoy by adults, it's a bad children's story". For readers who are looking for stories where there aren't good people or bad people but just people, this is your book. This story will provoke you many moods and states, you will smile at some moment, you will hate at other, you will cry in yet another. And all that it's okay. I think that this book should be to be read at some moment in your lives. Please, don't let that those labels of "children", etc... in the genres of the book keep you away of the book, not matter how young or how old you are. If you want to read this book, please do, you won't regret it. It's about something important. About something needed to be read. I enjoyed this tale, though I have to admit I wasn’t as blown away as the masses of other reviewers seemed to be. I’ve read a lot of books on tough topics, including illness and while I believe this one was done very well it didn’t stand out from among many others. However, I thoroughly enjoyed Ness’s approach to his subject. 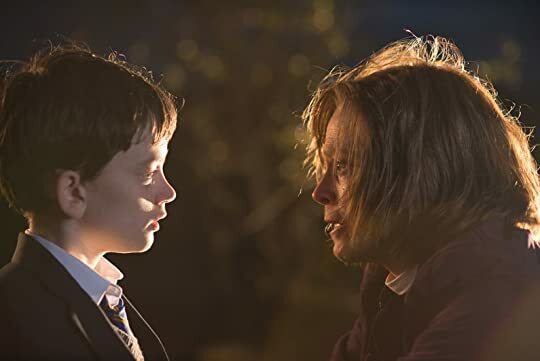 Conor, a young boy whose mother is terminally ill, is visited by a monster every night at 12.07. This monster is to tell Conor three stories, and at the end of these stories Conor will tell his own. The stories were very good I found. The focus on human nature and how every person is complex. The person you may think is the villain may not actually be as evil as you first thought, and the one you thought a hero may actually have done some dark deeds. Conor’s struggles with his mother’s illness, his dislike of his grandmother, troubles at school and a brief visit from his absent father all make the situation very real and difficult. Overall, a quick and enjoyable read and I will be giving some of Patrick Ness’s other works a go! i think this is honestly the best book about grief and coping that i have ever read. it was a wonderfully imaginative and truly insightful story. i love how it expressed such a tender subject in a really wild, but gentle, way. i wish i had half the creativity and story-telling ability that patrick ness has. i cant believe such a powerful message was held within such a tiny book. it just goes to show that you dont need a lot of words to impact someone if they are the right words. Well I am a hot mess of emotions right now. This book was so good and so important. It handled grief so well and I just...I am emotional. I think this book is very important and that lots of people should read it and yeah, that's about it. It's not a story, it's A Monster. Read it..get it all out..Call the Monster..
"القصص كائنات وحشية، عندما تطلقها من يدري ما الدمار الذي يمكن ان تخلفه"
It's not a story, it's a Wreaking Ball. A friend told me it's a life lesson.. no, It's not a story, it's A Monster. A friend told me it's a life lesson.. no, I don't see it that way. "هل ظننت أنني أقول لك حكايات لأعلمك درسا؟ هل تعتقد أنني أتيت لك سائرا من الزمن واﻷرض نفسها ﻷعلمك درسا في اللطف؟"
لا يهم ما تفكر فيه، ﻻن عقلك سيناقض نفسه مئات المرات كل يوم. عقلك سيصدق اﻻكاذيب المريحة وفي نفس الوقت يعلم الحقائق المؤلمة. وسيعاقبك لتصديقك كلاهما"
It's not a "life lesson" story much as it's a Life Story in itself. It deals with grieving, letting go.. living with pain..living with dying..and life after death. In a very simple story yet with very deep feelings. The theme of losing a closed ones due to this cursed illness.., all these hard times..all the pain. Even if you're just away of all that, reading these vivid characters you'll feel the pain, you can sympathy and have an understanding for those who had that first handed. "القصص جامحة، وحوش ضارية تجري في أتجاهات لا تتوقعها"
I feel like every time I love a YA book I start my review with "I don't read a lot of YA, but..."
Patrick Ness is the best YA author out there. If you haven't read the Chaos Walking trilogy then please put everything in your life on hold and go find a copy of The Knife of Never Letting Go. This is the only book I've read from him outside of that series, but this book is just as amazing. I would also recommend picking up a physical copy of the book I feel like every time I love a YA book I start my review with "I don't read a lot of YA, but..."
Patrick Ness is the best YA author out there. If you haven't read the Chaos Walking trilogy then please put everything in your life on hold and go find a copy of The Knife of Never Letting Go. This is the only book I've read from him outside of that series, but this book is just as amazing. I would also recommend picking up a physical copy of the book because the illustrations and the entire presentation in real book format with real pages made from real trees just makes the entire experience that much better. I decided to read this after I watched the trailer for the movie that comes out later this year. The movie looked really good, I recognized the author, one thing led to another, yada yada yada, and I finished the book in one sitting. Then I put everything else by Ness on hold at my library. Then I put everything I could find by Siobhan Dowd on hold at my library. So I don't read a lot of YA, but I do. And this book raises the bar on the genre. It's like what Neil Gaiman tries to do with fantasy on a whole nother level mixed with John Green's tear-jerking coming-of-age stuff. It's short and there aren't any wasted words or pages. It begins and ends beautifully with fantastic stories within the story. it's something I feel like I'll be thinking about for a while. Patrick Ness never disappoints me, so I naturally knew going into this it was going to be impeccable but Jesus nothing could’ve prepared me for how hard this hit. It was sad and extremely powerful and heartbreaking, and immediately after I was finished reading, I gave both my parents the biggest hug. The art was beautiful and dark and went perfectly with the story. My only problem with this book was that it didn't make me cry like sooo many people promised it would. Maybe I’m just cold-hearted a Patrick Ness never disappoints me, so I naturally knew going into this it was going to be impeccable but Jesus nothing could’ve prepared me for how hard this hit. The art was beautiful and dark and went perfectly with the story. My only problem with this book was that it didn't make me cry like sooo many people promised it would. Maybe I’m just cold-hearted and mean, but I spent most of this novel waiting for the shoe to drop and for the floodgates to open, and they never did which kind of impeded my reading experience, and that’s really the only reason I can’t give this book five stars.